Special treat for the interview today... working with his busy schedule, taking time to chat about his latest release "Cabin Fever: Patient Zero"... composer Kevin Riepl. You might remember "Howlin' Wolf Records" released "Silent Night" with us last year, I am thrilled to finally get to share and chat with this awesome composer. You really should check out more of our releases and of course Kevin's [CLICK HERE]... you will not be disappointed! THANK YOU! Jeremy [Howlin' Wolf]: Please tell us your involvement on "Cabin Fever: Patient Zero" and how is working on the third film in the series? 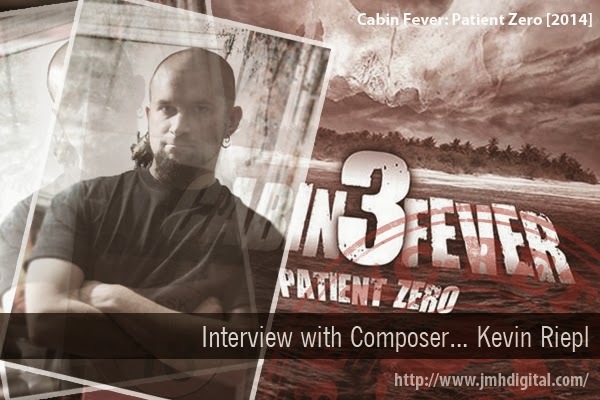 Kevin Riepl: I am the composer of Cabin Fever: Patient Zero. I met the director, Kaare Andrews, when we worked together on his contribution ‘Vagitus’ to the ABCs OF DEATH horror anthology. Working on Vagitus with Kaare I knew he had a great vision with storytelling and I feel we clicked well creatively. When hearing that he was going to helm a prequel to Cabin Fever, I was excited to possibly have a shot at working with him again. The fact that it was a prequel and not just a rehashing of the story was what made it interesting to me. This also affected how I approached the music. I wasn’t tied to any musical ideas that were established in the original or its sequel, allowing me more freedom in developing the musical palette for this one. Jeremy [Howlin' Wolf]: With a mix of scores under your credits do you prefer game or film/television work? Kevin Riepl: I’d hate to provide you with a cliché answer, but I love working in each medium. Each have things I love about them. Some aspects of writing for games may fill a creative void that film and television work don’t or can’t provide and the same goes the other way around. Still often to this day in games, composers get to flex their big ‘action and dramatic score’ muscles to help fit the ever expanding size of game environments. For films, not only am I scoring a story in a linear way, which most games don’t offer, it also allows me a more emotional connection with the content. Jeremy [Howlin' Wolf]: How much creative control do you have working on any of your projects like “Cabin Fever: Patient Zero” and where do you find inspiration? Kevin Riepl: Some directors and producers are more hands-on during the creative process. Sometimes providing input on aspects of the score, to the point where it becomes a collaborative effort. Aside from honoring the director’s original creative vision, I think I have been lucky enough in my past and current projects to have full creative control over my scores. My inspiration for the music begins with my initial discussion with the director and listening to them tell me about the movie, their vision and what kind of story they want it to be. There are times that I like reading the scripts to help with ideas, but the key thing is, as a composer, we score visuals and emotions that are on-screen. From script mode to final lock, so much has changed that what I ‘created’ in my head, is nothing like what I see on screen. So early on, I usually use the script to help out with a musical palette and select what specific instruments I think will work well with the story, character, and/or environments. Jeremy [Howlin' Wolf]: I asked composers all the time, is it weird to have a fan base and know that some fans know your scores better than you sometimes. Is it a nice feeling to have score groupies? Kevin Riepl: I do really enjoy having fans that love and have a passion for film or game music. I appreciate it greatly when they go out of their way to email, Tweet, or Facebook message me about my music. I’m always appreciative of their passion and that they are listening to something I created, which is humbling and a great feeling to experience. The main reason I started in music was because of how music made me feel and how it triggered so many emotions. To have been able to tell (or share) that with all the artists, composers and bands that evoked those feelings when I was young would’ve been awesome. So when someone has experienced my work and takes the time to share that with me, it’s a great feeling, and if I am not neck-deep in a project, I do my best to respond to all of them. Jeremy [Howlin' Wolf]: Game music is much more of an art than just music, do you feel that vintage gaming should be remembered in modern gaming and do you have a favorite game modern/vintage/both? Do you play the games you score? Kevin Riepl: Vintage gaming should never be forgotten. We should always keep in mind what made that era of gaming fun and addictive and incorporate elements into modern games. Many aspects of vintage gaming are returning in many smaller style games, whether it be on a mobile app or through the Xbox or PlayStation online stores. People are hugely addicted and the sales are insane. There is something to be said about that. I do indeed love my side scrollers. The Cave, Shadow Complex and Deadlight, for example, are all games, in my opinion, that borrowed gameplay elements from vintage gaming. I am a huge fan of the Batman Arkham games and cannot wait for Arkham Knight. Also, one of my favorite trilogies is the Uncharted series. I try to spend some time playing the games I’ve scored, not only as a gamer but also as someone who was creatively involved. A lot of effort by a large group of people was put into creating each project and it’s always fun to experience the final product. Jeremy [Howlin' Wolf]: Where does a typical day begin and end for you, are there typical days? Kevin Riepl: Waking up at 7am, showering, breakfast and getting into the studio is about as typical as it gets. Usually when I have more than one project on the schedule, things can get pretty crazy, changing from day to day. But by the end of the day, which is usually 1am, I try to get a good amount of writing in, which on a good day is 2 to 4 minutes a day. Typical days or not, I’m grateful that I get to write music every day for a living.